Only one week to go until Howard Days! Here's a look at the Saturday afternoon & evening activities in some detail. Like we were saying, you'll be on your own for lunch on Saturday. With the great restaurants in Cross Plains and the Barbarian Festival serving up some good ol' Fair Grub, you won't go hungry! 2 pm Panel - Fists of Iron. Mark Finn, Chris Gruber and GOH Patrice Louinet, the Editors of FISTS OF IRON, the four volume boxing set from the REHF Press, are together for this one time only panel to discuss Howard's History with boxing and the stories he wrote. (Did you know REH wrote more boxing stories than any other genre?) Come hear the experts tell you all about it. Featured Guest artist Tom Gianni will also be present to talk about illustrating these stories. At the Library. 3:30 Panel - The World Building of REH. Follow Patrice back to the Pavilion where he'll join Rusty Burke and Jeff Shanks for a discussion of Howard's history and penchant for creating fantastic worlds. NOTE: THIS PANEL IS AT THE PAVILION. After this last panel, folks hang out at the Pavilion and browse the Swap Meet for just a short while, anticipating the short drive to the final scheduled event for Howard Days. If you are heading to the BBQ, this is the time you will need to sign a release form to visit the Ranch. Details will be available. 5 pm to Sunset: The Caddo Peak Ranch BBQ. At 5 pm we caravan 5 miles west on Highway 36 to the Caddo Peak Ranch, where owners Marsha Murray and Janet Swanson are our gracious hosts for a genuine outdoor Texas chuck wagon BBQ dinner. It is another highlight of Howard Days and all are welcome! You'll feast on delicious brisket, sausage, potato salad, dessert and all the fixin's while enjoying the fellowship of your friends old and new. Before dinner, you may decide to ride up to the base of West Caddo Peak (pictured above) and trek to the top for a view of Callahan County like no other. This is fairly rugged climb and it is advisable to take a bottle of water with you. After dinner we gather on the rise and watch a gorgeous Texas sunset and say our goodbyes to a wonderful weekend. PLEASE NOTE: THE OWNERS OF CADDO PEAK RANCH HAVE REQUESTED THERE BE ABSOLUTELY NO SMOKING AT THE RANCH. Please respect their wishes - it will be greatly appreciated. Thank you. 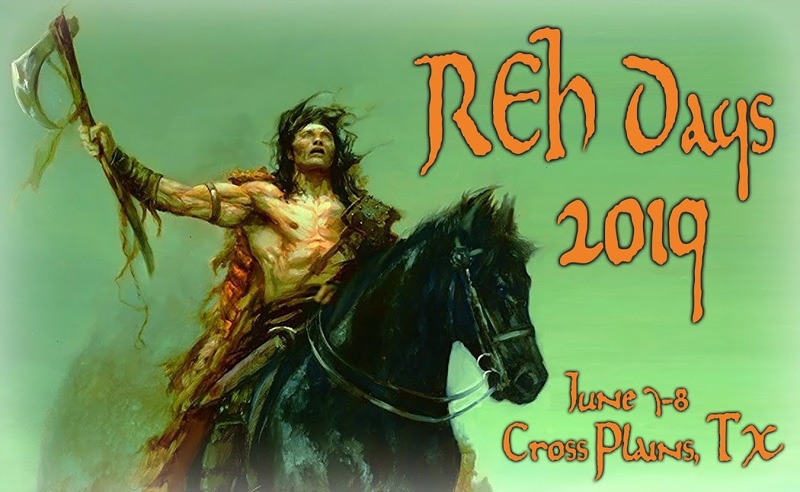 The final REH Days activity is a gathering of folks back at Pavilion for a final evening of conversation, fellowship and poetry reading as we celebrate the Legacy of Robert E. Howard one final time.